Ever since I became a practicing disciple of Jesus, going on about 15 years now, I have been struck by how non-intuitive Jesus is for me, a middle-aged woman, who is a product of American culture and mores, including The American Dream. Gratefully, the more I get to know Jesus, the more things tend to make sense from His vantage-point, and the more comfortable I grow with trusting Him with the times when life doesn’t make sense. Jesus is just so much bigger than the setting in which I’ve gotten to know and love Him. And His big ideas include the uncomfortable and the unseen—acts of change and faith in the walk of following Him. Just last Sunday, our pastor clarified the meaning of the word “disciple”. To be a disciple of Jesus is to not only follow Him, but to be changed by Him, so that we can be engaged in others’ lives, investing in them while the Holy Spirit changes their hearts. When my heart is truly softened, I know that in order to be like Jesus, utter dependence upon and surrender to Him is key to the abundant life He wants for me. I know that in order to be more like Him, I might will suffer as He suffered. So how does this life change really look? Well, it actually turns my American Dream upside down. I don’t know about you—maybe you don’t know Jesus—welcome! But for me, while being a disciple of Jesus is the best thing I’ve ever done, it has also been THE STRANGEST THING EVER! To one who was raised by a single mom to be as independent as possible (never depending on a man because, gurrl, they will let you down), and with the pulling oneself up by one’s boot straps mentality, relying fully on anyone, especially one whom I couldn’t see, hear or touch made about as much sense as running into a busy street to play. Why? Because I’m not used to looking with an eternal focus. I’m used to counting the cost and protecting myself, since it was always my understanding that unless I looked out for me, no one else would. It’s so much easier to focus inwardly. To resist change. To hold fast to control. To keep the circle of trust love and care small and insulated from the ugliness of the world. Because there is ugliness. People are hard to love (not me, mind you, but “people”)—they can be rude, ungrateful, different, and possibly, scary. Oh, and I don’t know about you, but I like to be first in line, go first class, and, if I’m completely honest, live in my first world country with all its first world problems. In short, I like my comforts and American Dream, thankyouverymuch. In short, so that I may seek justice, love mercy, and walk humbly by His side. With a changed heart, I see that worldly success is fine, but that the most successful people in this life are those with eyes on their eternal prize – living with God forever. So how about you? Have you turned to face the strange ch-ch-changes? It’s always refreshing, or better said, life-giving, to hear others open their hearts and share unguardedly. Having grown up in survival mode, it became a deeply engrained habit to just survive – to do whatever it took to get by, and don’t overthink it. Trusting someone else with calling the shots has been and will likely always be hard for me, and likely you too. My husband sometimes complains about it, i.e. those times when I think it, plan it, and run over him with it – whatever ‘it’ is. Christ doesn’t complain but I’m pretty confident he’s too often in the wings watching, thinking, Oh girl, if you’d just slow down, let me lead. When I actually succeed in doing that the path is often different than I expected, generally much bumpier, but as I learn to lean in I sometimes see that it takes me to a place that is right for me. I know you’ve had some of these same experiences, had to figure out how to open your hand and let go of what you thought you were going to get to hold. In my experience it never gets a lot easier, but it’s a sweet experience when, once in awhile, I get a glimpse of how much better his ways are than mine. How patient He is, how gracious as I oh so slowly change into the woman he’s planned for me to be. One day at a time! No can do. 🙂 Or, I will if you will. It’s funny how when we give God the wheel and allow Him to change us into the person He wants us to be, our stubborn pride flairs up. However, as you’ve stated, the rewards for allowing Him to give us a “heart of flesh” puts us in a position to not only operate through His change in us, but to deflect that heart and change on to others He puts on our path. 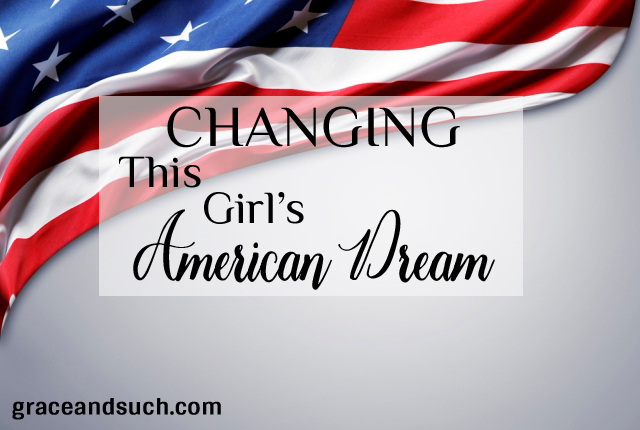 Thank you for sharing change in relation to your American Dream. Appreciate your stopping by, Denise! Thank you for your kind words. That heart of stone to a heart of flesh thing? Daily struggle. 🙂 But.so.worth.it. After living 76 years since being saved at Lake Sammamish Bible Camp, the Lord Jesus has become so very precious. Been a widow for 14 years so have had to learn to read the Word and pray myself instead of expecting my godly husband to take care of that. How good it is to hear of others trusting day by day to be more like the Lord!!! Since the Lord hates pride….it must be very ugly in His sight. Thank you for your words, Bel! I’m not a widow, but I do have a spouse who doesn’t have a relationship with Jesus, and it’s true: we have to read and pray, ourselves, for our relationship with the Father is our responsibility (and our great joy!). Appreciate your stopping by!